However, It’s not easy to buy from limited items websites, Specially,such as Supreme (http://supremenewyork.com) and Nike…Lots of people who want to collect their limited items, But In Most of the time,The item was sold instantly… To tackle such situations, Let me tell you how to win this game on supreme. When purchasing these shoes online, you can definitely use the Supreme bot such as EasyCop and AIO Bot, which increasing your chances of being one of the few hundreds or thousands to own a pair of limited edition shoes. Now EasyCop cannot works on supremenewyork anymore, Particularly the boring Captcha is a obstacle for that, if you do not trust the Supreme bot anymore, I would suggest you could use autofill extensions and you have to manually beat the Captcha. Other bots claim to support Supreme, AIOMacBot, ForceCOP and HeatedSneaks, Note: I not used those three Supreme bot, and I appreciate if you can share your experience on those Bots. However, Even though bots increase your chances at being one of the few to own a coveted pair of Supreme shoes, the number of tasks gets limited. IP addresses get banned when numerous tasks are conducted from the same address. The best solution to this problem is the use of proxies, since they are the most effective way around all the restrictions. So, Want to get multiple supreme items at one time? When you purchase a bot you expect to benefit through it as it allows you to automatically handle at least 10 to 15 tasks at once. However, when using a bot your IP address remains the same, which eventually leads to failed transactions in most cases. When you are unable to get a pair of shoes with your Supreme bot, it is time for you to start using proxies as they allow you to access more IP addresses which eventually results in more accounts and more tasks. In order to get accessing smoothly, You should use more account to Cops! But Obviously, it’s can not run multiple accounts on your PC or mac without proxies for it’s the same IP address that’s ISP assign to you. That’s the reason why you should use the proxies for supreme.The proxies can help you unblock their limit based on IP address. More accounts to cops mean that, It’s give you more probability to win this game than others. So it’s not difficult to cop limited upcoming sneakers from Supreme! Once you decide that you want to use a proxy, you need to deal with several options as there are numerous popular proxies available, which can assist you in obtaining more than a few pairs. You should choose only the best proxy as only the best offers fastest service which in turn increases your chances at obtaining more pair of shoes. Thus, choose only from amongst private proxies as they offer better and quicker service than public proxies. Public proxy servers are free, which results in them being unreliable, slow and disrupting your usage with plenty of ads. Not only do you have to share them with other users, your payment information might at times be collected by wrong sources and it is likely that a previous user might have gotten the IP banned from the web store selling products. By relying on private proxies, you have lesser individuals to share the network with and there are no ads interrupting your work. Speed: Speed is necessary as a fraction of a second can make or break a deal. Private proxies offer better speed when compared to their public counterparts which increases your chances at making a deal. Nearby geographic location: In some cases it is an important factor as stores often have time based filters. Some stores have conditions regarding locations for shipping and you might need to appear local, thus a proxy with nearby location proves useful in many ways. Now, The CDN network of Supreme are mainly located in Ashburn, Newark, New Jersay and Virginia. Which type of IP address is suit to bypass the Supreme? Now 80% of ordinary private proxies may be already blocked for Supreme marked and banned 80% IP address located in datacenter subnets (I check Almost 100% IPs from Vultr are blocked…). 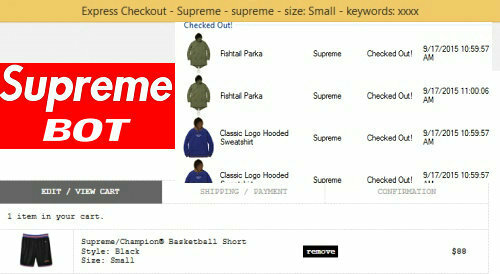 So I suggest you have to find fresh dedicated proxies package which specific for Supreme. if you have technical skills you can use the residential proxies for Supreme.